Last weekend I was in London for 24 hours. My wife and daughter were visiting a sewing show at Excel so I had the day (Sunday) to myself. The weather was glorious – sunny until late in the afternoon, quite still, and quite warm by mid-afternoon. We were staying at in Stratford in East London and on looking at a map I spotted that there were a number of canals and waterways nearby which I decided I would spend Sunday walking along. First up was the River Lea Navigation, which I encountered in the Queen Elizabeth Olympic park. It’s been significantly tamed – as you can see from the couple of shots I got of this waterway, it’s been incorporated into the Olympic Park. Next was the Hertford Union canal, a short (couple of miles) canal linking the River Lea with the Regent’s Canal. This was very much a typical narrow-boat canal of the kind I’ve seen all over England. There was even some canal boat activity – saw a boat being locked-down towards the River Lea. The environment this canal runs through is quite ‘gritty’ – there are still a lot of older building backing onto it, and the canal-side architecture has been ‘enhanced’ by the street artists. However, the canal also runs alongside Victoria Park and I diverted into the park for a while. The western end of the Hertford Union forms a T-junction with the Regent’s Canal. Annoyingly, this was the only area on this walk where I had to divert away from the canal. There’s an apartment development under way – Bow Wharf – with the apartments expected to cost up to £1M. How the East End has changed! – although I suspect that this part of the East End was always one of the better parts. Once back on the Regent’s Canal I was walking along the edge of Mile End Park the Regent’s Canal runs alongside it for a mile or more – and I was struck by the new architecture on the opposite bank. Was this canalside the focus of early development? Certainly it all looked much more modern than the housing along the Hertford Union. Not a much life on the can, however – for long stretches the surface of the water was completely covered in green algae which suggested to me that there wasn’t much traffic along it. 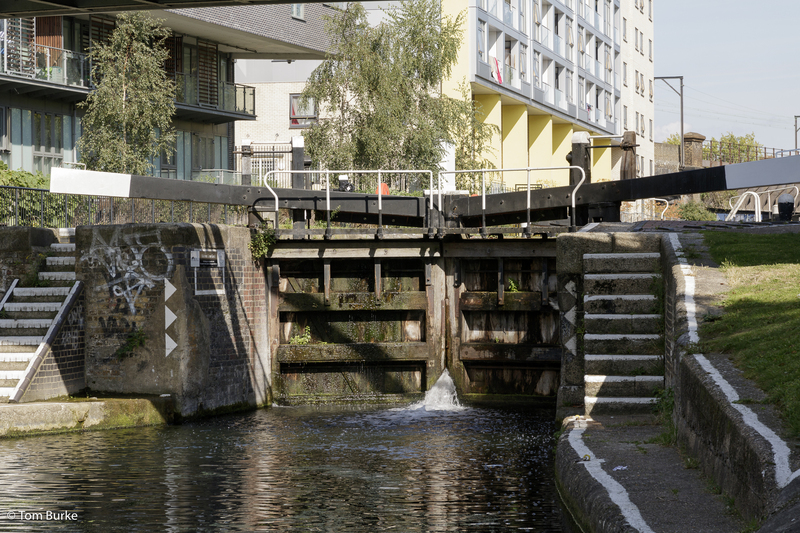 The final stop for this main walk was Limehouse Basin, at the end of the Regent’s Canal, and the site of a junction between the canal and the Thames. That said, I assume that the purpose of Limehouse Basin was to permit transhipment of goods from canal narrowboats to Thames barges & lighters, and vice-versa – I’m not sure about narrow boats on the tidal Thames! Today, as can be seen from one of the pictures, Limehouse Basin is home to a great many pleasure craft of different sizes. Later – after a break for lunch and a relocation to the O2 area, via Canary Wharf, I walked along the Thames from the O2 to Greenwich. By this time it was getting hot, and annoyingly i again had to divert into a back street because the Thames path is currently blocked by a new development. But the walk along the Oval College was as magnificent as ever, and there was a cruise ship moored at Greenwich Pier. “I need to reboot your room”…. ….is what the chap said to me at my hotel yesterday evening. I’ve been staying at a capsule hotel – “hub by Premier Inn” – very near to St James Park tube station in Westminster. The rooms in these hotels – there are several in London – are very small but very well-featured. They have all the required elements – bed, bathroom, TV, air-con/heating, a bit of storage space – but all very modern and very high tech, and are extremely compact. So I returned to the hotel after a meal out, walked in, and the lights came on automatically, exactly as they should have. Rather unexpectedly they went off again about 30 seconds later, leaving me in complete darkness. I found my way back to the door and opened it, and the lights came back on. Then the cycle repeated itself. I did some experimenting with what was happening but eventually gave up and reported the problem, and a few minutes later a very helpful and polite chap arrived to ask me what was wrong. I demonstrated the problem which elicited the response “that’s not supposed to happen….. never seen that before, in fact!”. Then he said the unforgettable words – “I’ll need to reboot the room”. He opened a small panel and hit the Reset button, at which point everything in the room just shut down. Up to that moment I hadn’t realised just how hi-tech the room actually was – lots of systems all under customer control via a control panel on the bed head (or via an app on your smartphone). There are five different settings for the lights, for example. But right then all the systems were all off. There was silence (and darkness, of course). Then bit by bit the room rebooted and the systems came back up. Sadly, the reboot didn’t resolve the issue – 30 seconds later we were in darkness again. At that point the problem had to go to Tier 2 support, and unfortunately they weren’t available in the evening; and as a result I got a new room in which I had an excellent night’s sleep. Apart from the problems with the lights in the original room, this was an excellent stay. I haven’t mentioned the lounge by reception. There are no tea/coffee making facilities in the room; instead, there’s a ‘hot drinks’ point in the lounge where tea and coffee are available (from a coffee machine/hot-water dispensers) 24/7. The lounge is also where the continental breakfast is available – simple cereal, sour-dough bread, croissants, muffins, butter, preserves and a toaster, and also where they put out the same sort of things as a simple buffet in the evening. The evening buffet seems to be free, but breakfast was £4. You can also get drinks – they have wine and spirits available, but you have to get one of the staff members there to serve you. All in all, this was a much better experience than my Airbnb in London experience last year, even with the lighting problem. I shall probably use something like this again.